As we enter the 5th month of the year, BMOrg are managing to be strangely silent, while at the same time being all over the news. The “Burning Man Organizer Throws Bundy Fest” story has been picked up by mainstream organizations like Washington Times, Fox News, Reno Gazette Journal, Las Vegas Sun, Daily Kos, topix, Raw Story, The Blaze, Spin; as well as “alternative media” sites like Godlike Productions, BeforeItsNews, DiscloseTV, FARK, the Daily Paul, and even Datehookup.com. Burning Man’s response to the confusion has been tepid. Communications director Jim Graham said in an email to the RGJ: “The person is not a Burning Man organizer and we actually have no information on him”. On their Facebook page, they said “For the record, the Burning Man organization has absolutely no involvement whatsoever with the so-called #BundyFest or its supposed organizer Sean Shealy.” This information may be useful to Burning Man’s community, but how many Fox News reporters are reading their Facebook page? As far as we can tell, no press release has been issued. So this is the total extent of their denial. 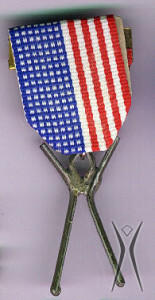 Instead, BMorg wrote a blog post entitled “why doesn’t Burning Man take a stand?” They published this with a new logo, mixing the Burning Man symbol with the American flag. This blog post and logo was put on the front page of their site. The post doesn’t explicitly say “we have nothing to do with Bundy Fest”, but it does try to throw them into the political mix. In answering their own question “why don’t we take a stand”, they are, in fact, taking a stand. The stance they take is “we try to stay out of it, because radical inclusion means everyone is welcome; and immediacy means we can resolve political problems with face to face discourse”. Certainly, the Feds are welcome. BLM special agent Dan Love, who led the machine gun brandishing, cow and tortoise killing, woman-tasering Federal team at the Bundy stand-off…also leads the SWAT team-like BLM forces at Burning Man, looking to bust Burners with their night vision goggles, drug sniffer dogs, and fully automatic weapons. Supposedly, the cowboys are welcome, as long as they don’t bring their horses. The militias are welcome, as long as they don’t bring their guns. The Second Amendment is suspended at the largest event on Federal Land. Now and again somebody tries to tempt (or badger) the Burning Man organization into taking stand on a political issue – most recently the dust-up at the Bundy Ranch in Nevada. We believe the best way for people to develop and evolve their political positions toward a better future is through interpersonal connection, sharing ideas, and engaging in informed dialog with people representing a diversity of perspectives.While many of our staff are politically active (across the entire political spectrum, actually), we pride ourselves on facilitating and cultivating a community that welcomes all political stripes. And religious stripes. And genders. And races. And creeds. And sexual preferences. And … you get the idea. Does Burning Man really think that everything would be fine, if these good ‘ole boys and patriot militias showed up en masse? There is nothing in the Ten Principles, or anywhere else in the ticket rules, that specifies a dress code for the party. And yet – can you wear jeans, shirt and a cowboy hat (if you’re not Larry Harvey)? Can you wear camo pants and Ron Paul t-shirts? An LA Clippers jersey? Perhaps you might answer “yes”, but come on – that’s theory, not practice. In practice you would be attacked by mobs of burnier-than-thous. You would be booed and jeered. There is an expectation to conform to Burner culture, as we explored in this earlier post “everyone’s unique except me”. “Participation in society” and “dressing half naked in costumes, taking drugs and dancing on an art car” are not the same thing. Going far, far into the desert, and partying with other like minded people, is more like participating in a commune, than society. It seems to me that BMOrg are quite content for the media blitz about BundyFest to continue, spreading their name to new audiences. They are even trying to capitalize on it by positioning themselves as an appropriate venue for political discourse – between us Burners, with BMorg staying neutral and providing “the crucible”. I’ve camped with Clan Destino since 2002. We had a meeting last night, and decided for the first time they we’re going to pass on BM this year, and put all our effort into BundyFest. We’ve always wanted to extend our time on the playa, we have more resources to offer than can be delivered in just 1 week. So we’re going to spend the whole month at BundyFest and offer the same entertainment and services we’ve offered for over a decade at BM. This decision was made for this reason, plus the fact that LEOs raided our camp last year because someone rolled a tobacco cigarette. The dogs were called in, and every tent and vehicle was searched. They found nothing, and even Black Rock Rangers helped to turn our camp upside down. It’s just the evolution of Burning Man. It was just a matter of time before something like BundyFest would take over. I hope to see all of you out there. As for the strange silence, we are still waiting for the announcement of 2014 Art Honoraria winners, the new web site, and the restoration of the marketplace. What do you think, Burners? 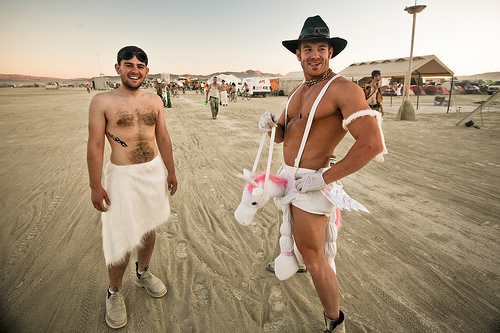 Should you have to dress like you’re at Burning Man, to be part of it? Or should people come in their everyday clothes, because everyone is welcome and we want to evolve their political ideas?